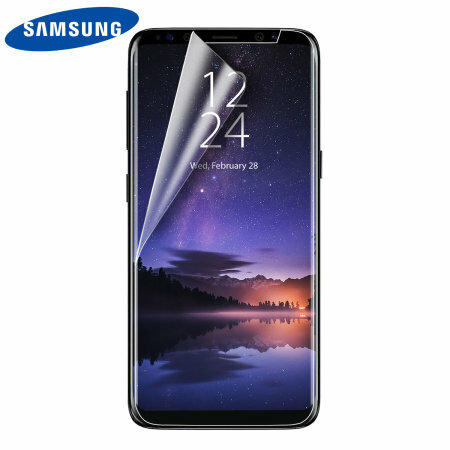 Keep your Samsung Galaxy S9 screen in fantastic condition with the official Samsung scratch resistant screen protector. This twin pack represents amazing value and twice the protection. Good, clear protector that fits well with Samsung LED flip cover/ case. I found it easy to apply, although a few bubbles did appear. Suggest the placement be done carefully and next time I'll take more care. After using the "scraper" provided the few bubbles disappeared and the protector stuck well to the rounded edges of the phone. A bit at the top corner lifted but was easily stuck down again with some good pressing. Looks excellent and it's great to have a spare on hand too. Had this screen protector for a couple of weeks. Found it very easy to apply but after a couple of weeks it has started to lift at the edges but not enough to spoil the appearance of the screen. As the packet is a twin pack I have another one to swap if it gets too bad. They were pretty expensive when compared to others .As with most things I think you are paying for the name. This is a thin film, not a tempured glass cover. It seems the glass covers have a tendency to pop off after a short while. A problem I experienced. This film will protect from scratches, not sure about protecting the screen from cracking, we'll have to wait and see. Was fairly easy to install, provided you follow the instructions and have the patience to put it on slowly, getting rid of air bubbles as you go. I was afraid the sides would start to lift and peel off, but it's been a month and they are still firmly in place. Overall I am very happy with my purchase. This is the protector I was looking for. Its thin and easy to fit on the phone and it gives 100% protection . I had one on my last phone and it never let me down. Good price and you get 2 for your money. Another Official Samsung accessory I bought that doesn't meet expectations. All 4 corners have air bubbles and as fast as I remove them they reappear. I think Samsung should concentrate on making electrical goods which they do best! Perfect product, my only negative is that the delivery took about 10 days which was far longer than I had anticipated. Very easy to put on, but you need to make sure you remove any air bubbles while you fit it. This product is very good. These screen protectors are quite decent. Instructions were fairly straight forward and the adhesive on the entire bottom protectors snugs well onto my S9. Only 1 star removed as it does form bubbles on the bottom corners on my phones from time to time, which i think its because i misaligned my protector. Nonetheless, I have an extra sitting in the pack incase i want to redo it. I haven't used them yet!! Very good quality, with excellent service. Was a bit dubious as there is so much screen to cover but it went on first time with no bubbles and has stayed stuck. Brilliant, well made,it makes the phone slightly bigger but I can live with that as while at work I feel that my phone is protected, easy to remove and has a nice feel. Could have been a little bigger in places and the curved screen makes it bubble from time to time but works well. Works gr8 even on my s8! Very ;poor and abandoned within the hour. Product has potential for poor quality but thought the official Samsung product would be better. Sadly not. I purchased this screen protector for my phone and I must say I am very pleased with this purchase, it is very easy to put on and it is easy to get rid of the bubbles with the tool provided.